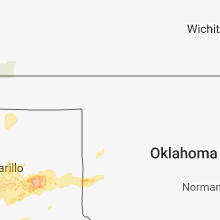 4:06 PM CDT Quarter sized hail reported near Dalhart, TX, 69.4 miles NW of Amarillo, TX, trained spotter reported quarter size hail with thunderstorm. 4:51 PM CDT Golf Ball sized hail reported near Hartley, TX, 53.6 miles NNW of Amarillo, TX, golf ball size hail reported by trained spotter. 5:02 PM CDT Quarter sized hail reported near Hartley, TX, 50.1 miles NNW of Amarillo, TX, storm chaser reporting quarter size hail with accumulation on area roadways. 7:03 PM CDT Quarter sized hail reported near Amarillo, TX, 5.6 miles NW of Amarillo, TX, hail is accumulating on the ground several inches deep. 8:03 PM CDT Golf Ball sized hail reported near Canyon, TX, 19.7 miles SW of Amarillo, TX, report received via spotter network. 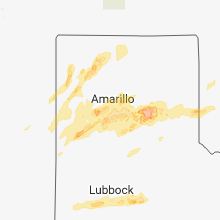 8:07 PM CDT Quarter sized hail reported near Canyon, TX, 16.4 miles SSW of Amarillo, TX, mping report. 8:08 PM CDT Tennis Ball sized hail reported near Canyon, TX, 15.1 miles SSW of Amarillo, TX, report received via spotter network. 8:15 PM CDT Quarter sized hail reported near Canyon, TX, 15.9 miles S of Amarillo, TX, highway is covered with hail up to the size of quarters. 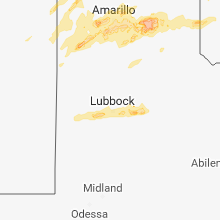 9:45 PM CDT Tennis Ball sized hail reported near Clarendon, TX, 41.7 miles ESE of Amarillo, TX, golfball up to tennis ball size hail on highway 287 east of goodnight resulted in a cracked windshield.